Hello! As most of you know already, I participate in the Splitcoaststampers Christmas Card Challenge. Every month I make four Christmas Cards, so I'm not stressed out in November trying to get 50 or 60 cards made. It is really hard to stay committed to this challenge; especially in the Spring when there is so much outside work to do, and the weather is so beautiful; the last thing I want to do is make Christmas Cards. But I'm always happy I did when November rolls around. To make it even simpler on myself, I often 'case' my Christmas Cards. This first one I cased from Jodi Collins. I used her layout and ornament ideas, but changed the paper, sentiment, and ornament dies. The 'December 25th' embellishment is a sticker from K & Company. The paper is DCWV 'The Christmas MatStack'. My second card uses a sketch by Silke Ledlow (FTTC147). It's the same paper as the one above. And here is one I came up with on my own. That's why it is so clean and simple! The image is retired Stampin Up! 'Window on the World'. The charm is from JoAnn's Fabrics and Crafts. The paper is DCWV 'The Christmas Matstack'. I put Stickles on the ornament. 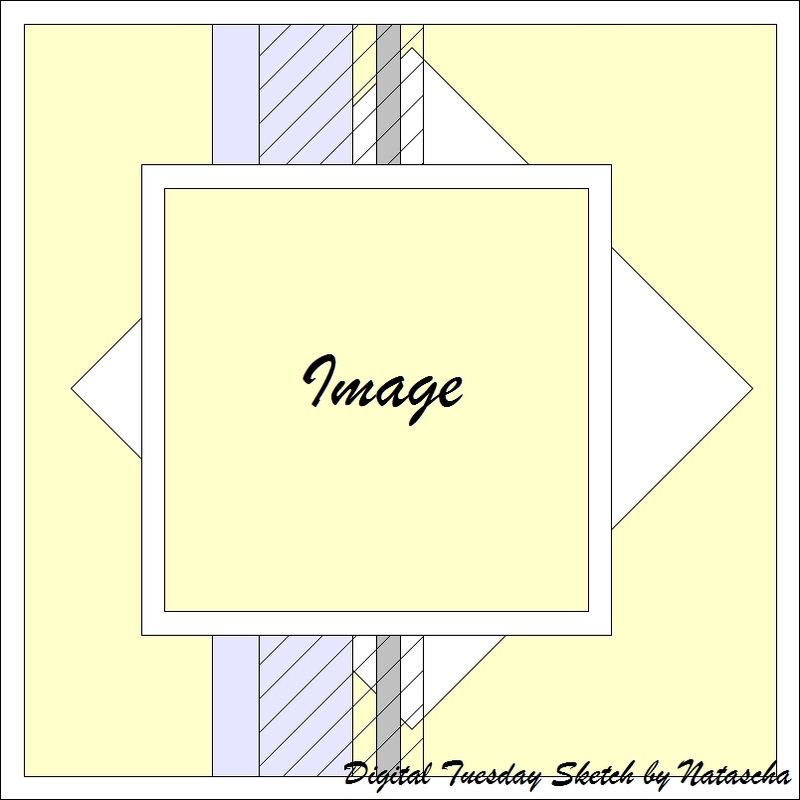 Hello and welcome to another Digital Tuesday Challenge. This week's challenge is hosted by 'Me! ', and since I couldn't think of anything creative to challenge you all with, I picked an easy one 'Just make anything, and use your favorite color!'. And be sure to include at least one digital element too! Our sponsor this week is Robyn's Fetish and they are giving away 4 digital images of one randomly chosen winner's choice. Well, the odd thing about choosing this challenge for me is that, I don't even have a favorite color! In the 80's my favorite color was 'peach', but when that fad died away, so did my favorite color. Now I seem to just like whatever is trending in the moment. I've been seeing 'mustard yellow' paired with 'grey' everywhere these days. It's in all the fashionable ladies clothing stores, and in home decoration fabrics. I really like the color combo a lot, so I decided to make my card using these two colors. My sketch is by Splitcoaststampers (SC377). The image is a digital image by Heather Ellis. The paper is 'Crushed Curry' by Stampin Up!. I paper pieced her dress and present, put the main image panel up on dimensionals, and added some Stickles to the crown. Hello and welcome to another Digital Tuesday Challenge. Our challenge this week is a Sketch Challenge! Simply make a card or scrapbook page that uses the sketch below, and be sure to include at least one digital element. Our sponsor this week is Doodle Pantry. To make my card, I used the Doodle Pantry image 'Cuddly Bear'. This image is now available in both outline, and pre-colored, and comes with several sentiments and digi papers. To make my card, I used the outline image and colored it myself, cut it out, and popped it up on dimensionals. My paper is My Mind's Eye Stella Rose 'Hazel'. The little hearts are brads.